If you have a vacation or investment property to sell in Davenport, FL or Kissimmee, FL you might be asking yourself if you should sell your property with furniture or without. In this post I will cover both the advantages and disadvantages of selling a vacation property with furniture and without. As a specialist in the area of selling vacation or investment properties in Davenport, FL and Kissimmee for foreign and absentee owners, I have been focusing my last few blog posts on highlighting information that is especially important for foreigners to know. • A Foreigner’s Guide to LISTING a Property in the U.S.
• A Foreigner’s Guide to SELLING a Property in the U.S.
Now that you have an idea of how the overall listing and selling process is different for foreigners, you can focus on the details, starting with whether or not you should sell with or without furniture. After all, that is an important topic to know! A furnished and well-staged property shows better than a vacant one. When rooms are furnished it gives the rooms a purpose as to how they can be used. That being said what shows better: a furnished and well-staged property or a vacant one? Put yourself in the position of the buyer at this point. As a buyer, would you rather buy a vacation home with or without furniture? Most likely yes! The majority of vacation homes do sell fully furnished, and for good reasons. • The buyer won’t have to spend additional time and money to choose furniture for the vacation property because it will already be in move-in condition. • If the buyer is an investor, is a plus if the property is being fully furnished. It looks like a great investment not having to buy furnishings. Again, it will be in move-in condition. If you sell the property with the furniture, the furnishings will be included in the contract as a no value item. You could also sell the furnishings but this transaction will be separate from the real estate transaction; it will be between you, the seller(s) and the buyers. Also, keep in mind that the furnishings might not be appealing to a wide range of buyers so why would they want to pay for something that is not their taste, worn out furnishings or furnishings that they think should be rightfully included since it is a vacation/investment home. If you plan on selling without furniture, you run the risk that some buyers will not see the property as a good investment as a vacation home. Buyers typically do not want to pay extra for furnishings that are already used. 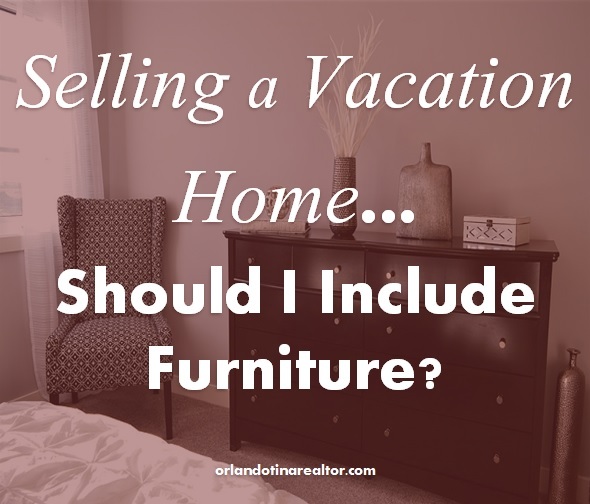 When would you want to sell your vacation home without the furniture if you already know that buyers would rather buy fully furnished? • If the furniture is in very poor condition it will not help with the sale of the home. Furnishings in poor condition will give the property a worn out feel and do not show well at all. Also, ultimately it will cause the buyer to have to have dispose of it after closing. (viewed as an additional expense) This will have that buyer moving on to the next possible opportunity. The bottom line here is that in some situations it would be in your best interest to sell your vacation or investment property with furniture to attract a higher number of potential buyers.